For several years, edible bean growers have had to deal with the prospect of anthracnose being a problem, particularly for growers of white beans. The disease, along with bacterial blight and sclerotinia, is a challenge to growers because of its capacity to reduce yield. 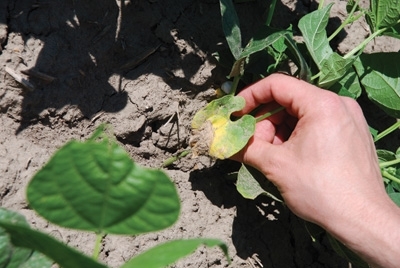 Yet in edible bean production, anthracnose is an issue for a different reason; because it can mar or blemish the seed coat, making the disease a threat from a quality standpoint, in addition to hurting yield. A trend that is taking shape in the United Kingdom is emphasizing the need for even greater control of anthracnose. In the UK, canned or baked beans are a dietary staple – they are eaten for any meal, including breakfast – and Canada is one of the major exporters of dry beans to the British Isles. However, where baked beans in North America tend to be prepared with a dark tomato sauce, diners in the UK are favouring a clear sauce for their beans. That shift means that any blemishes or marks left behind by anthracnose are more apparent and less pleasing to the consumer. And that means greater attention to disease management in Ontario fields is necessary. The lesson learned then was to drive around and monitor those areas of a field that were hardest hit with the infection. One of the key factors in dealing with anthracnose in the long term is the development of resistant varieties, which Jones believes will be available within three years. But Tenuta points out that anthracnose does not stem from a single-race pathogen. “There are differences in terms of some of the varieties, but we also have multiple and different races, and that throws a kink into the whole system as well,” he notes. That can also have an impact on how fungicides perform. “There’s no fungicide which is curative; the vast majority of applications need to be done preventatively,” reminds Bakker. Jones mentions that Quadris is another option for control of anthracnose. Beyond the farmer’s “bottom line,” however, is this growing reality for row-crop producers, particularly in North America: the consumer does have a say in what is happening on the farm, particularly with edible bean products.